Browse a romantic collection of Merry Christmas wishes for her. The only person who has the power to change your life completely. Let the spirit of Christmas brighten your soul and heart! 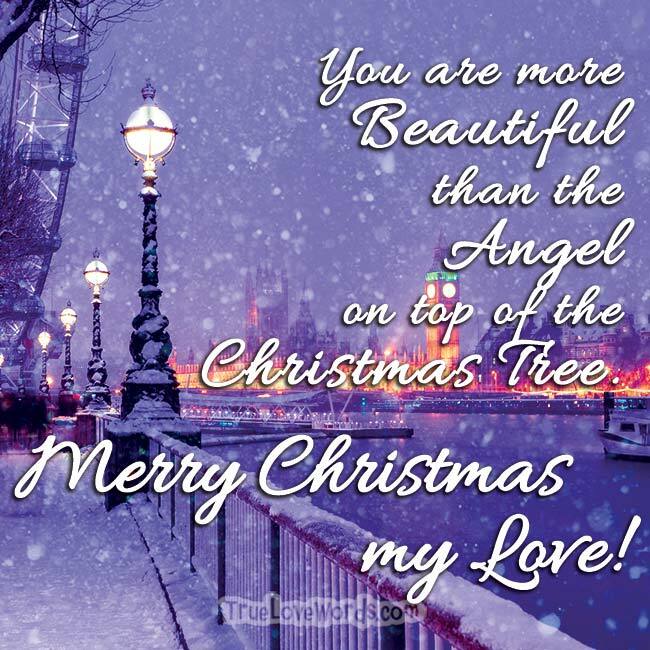 ♥ You are more beautiful than the angel on top of the Christmas tree. Merry Christmas to my one and only true love! ♥ Your love is the best gift I could ever wish to receive this Christmas. Thank you for making it extra special! ♥ When someone asks me what I want for Christmas, I tell them I already have the most amazing gift a man could want: the love of an incredible woman! ♥ As we gather around with our family and friends the Christmas I can’t wait to introduce you to everyone. I’m so excited that we have the chance to spend this holiday season together! ♥ I’m wishing a very Merry Christmas to the woman who makes my dreams come true. Thank you for fulfilling the longings of my heart. I love you! 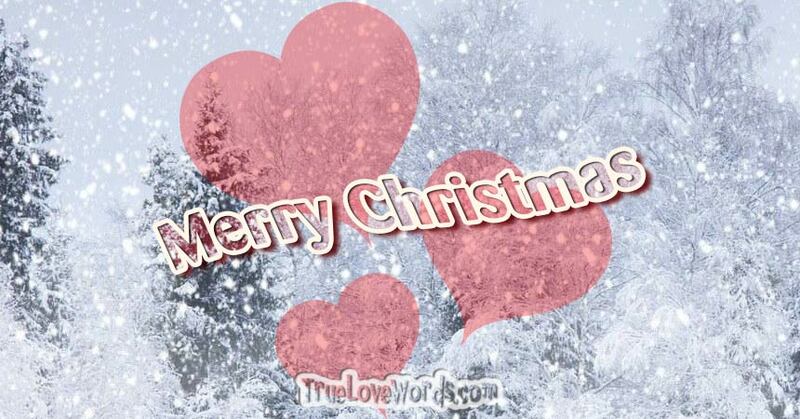 ♥ Christmas is the perfect time to tell you how much you mean to me. At this special season of giving I give you all of my love. ♥ Our love burns more brightly than the fire in the fireplace this Christmas Eve. Thank you for filling my life with light and my heart with warmth. I love you! ♥ You’re the best girlfriend I could ever hope to find. I can’t wait to spend this Christmas together and many more to come! ♥ Christmas is a time for laughter and closeness with those we love most. This year I’m thankful to spend this special time with you! ♥ This Christmas, let’s make sure to spend plenty of time together under the mistletoe! I’m looking forward to all this holiday has in store for us! Merry Christmas baby! ♥ Baby, you’re so irresistible that I think I’m going to wear a mistletoe wreath on my head this Christmas. That way I’ll be ready to kiss you anytime, anywhere we go! ♥ Whether it’s taking a walk out in the winter wonderland or getting warmed up by the fire together afterward, I can’t wait for us to make some amazing Christmas memories together! ♥ All the Christmas lights shine brighter when I see them reflected in your beautiful eyes. Merry Christmas my angel! ♥ May all the joy, hope, love, and peace of this special season be yours, my dear! I love you! ♥ As we celebrate the birth of our Savior this Christmas we’ll also be celebrating the beginning of our love. ♥ My love for you is as evergreen as the Christmas wreath on the front door. Every time you open it, think of my undying, unchanging affection! ♥ We belong together just like holly and ivy. I can’t wait to spend my Christmas with you this year, darling! ♥ Everywhere I go during this season, I’m reminded of you. The bright red holly berries remind me of your lips. The Christmas lights remind me of your sparkling eyes. The bells ring out the love I feel for you. ♥ I want to wrap you in my arms just like the garland is wrapped around the Christmas tree. I can’t wait to share a kiss with you under the mistletoe this Christmas Eve! Merry Christmas baby! ♥ This Christmas as we thank God for giving His incredible gift to the world, I also want to thank Him for another special gift He gave to me this year–our love! ♥ Christmas is a time for looking back at happy memories of the past, for expressing our present love for each other through giving, and for looking ahead to all the joy that the New Year holds. I’m thankful for the past, present, and future of the love we share! ♥ Your love is sweeter than a candy cane, more magical than Santa’s sleigh, and brighter than the shining lights on the Christmas tree! ♥ I love you more than words can express. This Christmas the only thing I want is for us to be together. Merry Christmas, my love! ♥ I’m overwhelmed by your love for me. I don’t think I could ever have done anything to deserve it. This Christmas, I want to give you all of my love, affection, and gratitude in return. ♥ I don’t deserve as wonderful of a Christmas gift as you. Thank you for being the most incredible girlfriend in the whole world. Merry Christmas dear I love you. ♥ Christmas is 100 percent better now that I have you in my life. I’m looking forward to spending every moment of this holiday season with the love of my life: you! ♥ There’s nothing I would rather do this Christmas Eve than sit by the fire, share memories of our relationship, and talk about our hopes and dreams of the future. I love you! ♥ Merry Christmas to an amazing woman who fills my heart with laughter and love all year long.